Welcome to the loose collection of islands in the southern Atlantic Ocean known as South Georgia and the South Sandwich Islands. Currently an overseas territory of the United Kingdom, the glacier covered main island of South Georgia was invaded by Argentinean forces on 19 March 1982 – triggering the start of the Falklands War. South Georgia is also the final resting place of British explorer Ernest Shackleton, who is buried somewhere just south of the settlement of Grytviken, which is looking a little run-down since whaling ended here in 1966 – you can still see the rusting remains of whale oil processing plants and abandoned whaling ships. 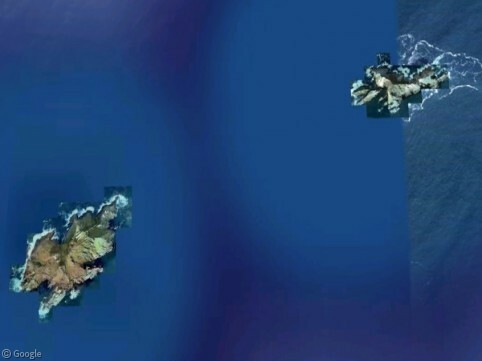 Most of the rest of the island group is uncovered by high-resolution, with the stunning exception of the Candlemas Islands, a pair of uninhabited volcanic islands surrounded by hundreds of awesome icebergs. Long list of further reading: South Georgia and the South Sandwich Islands, Grytviken, Falklands war, the Candlemas Islands, and finally the official site of South Georgia! The iceberg pics are terrific!! I also loved the iceberg shots. For people like me, maybe there should be a “snow and ice” category in your categorical index. I thought of a few previous posts that would fit, which I just enjoyed re-visiting – the pack-ice off of Newfoundland, Canada, all of the the posts from Iceland, Greenland and Antartica, and the Winter Olympics post from Torino. Surely that’s enough to warrant a category? Okay. Invading Iwo Jima I can understand. But this?! Sheesh! Across the harbor from the whaling station, this place looks almost inhabited: View Placemark Is that a doppler radar I see? Well found Marty! Those stations look pretty eerie huh? Actually, just last week Spacecraft made its long overdue debut. Nyaa nyaa. Might be adding an ‘Alex gets in wrong again’ category now too.